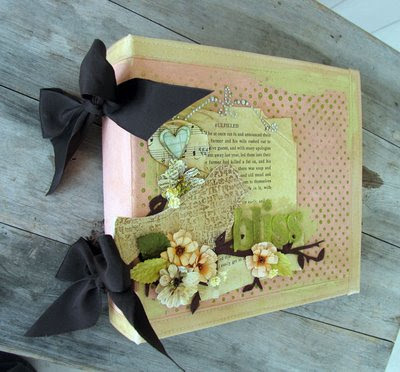 And we are headed for a big reveal night-the May kit is amazing! Wendy always puts together the best kits! When I first saw it-I wasn't sure what direction it would take me in. But it took on a life of it's own. I created some of my most favorite layouts with it...But in the meantime-I have some sneak peeks for you! Speaking of reveal night--it's tonight!!!!! Come on over to the BG forum and join us at 9:00pst for the party. There are prizes, games and sometimes a reveal before the reveal-wink! 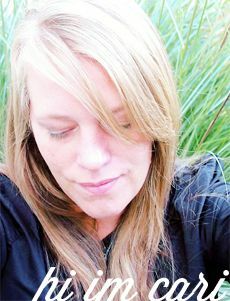 We are also doing a celeb chat with Janelle Smith from 7 Gypsies on May 5th @ 11am pst--what a great chance to chat with a Gypsie and find out where her Gypsy-ness comes from! Be back soon with my LO's! Haha!! I just got back from Buffalo where Pete and I saw the Grateful Dead in concert! My husband is a big Dead Head and he was so excited to see them on tour. I love to go and not only listen to the music, but also to people watch...Man-it doesn't get anymore entertaining than that! I was engulfed in a sea of Tye Dyes, dreads and Patchouli...among other things...:P Tent city was fun to walk through. It has a culture that is all it's own. t was a fabulous show! They played Bobby McGee (cool surprise) and of course-Truckin' among other favorite Dead tunes..
Then I visited Buffalo Stamps and Stuff on our way out of town to drop off my class album that I am teaching there on May 28th. It was great to see Sharon and Mark-they are the sweetest people of all time! And I also went to say Happy Birthday to my dear friend Jo--but she took the day off for her Birthday..sorry I missed you sweets! Hope you had a fabulous day! 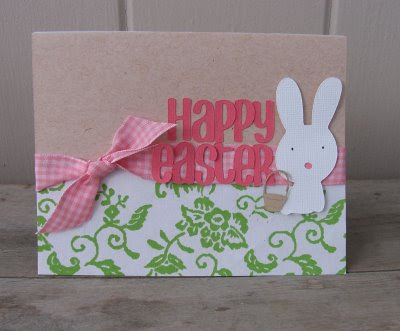 This card is for you!! I have been bust playing with my Prima goodies! I am loving this line by Adrienne Looman. 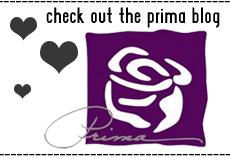 It's her Rebellious Line for Prima! 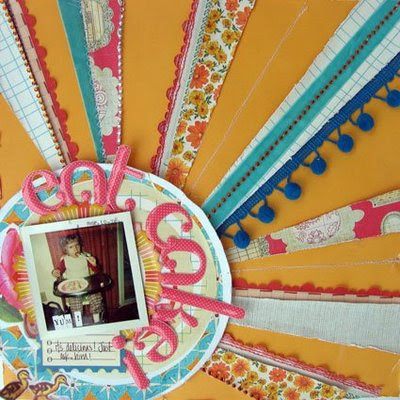 Perfect for older kids, teens or any layout you want to be bold and fun! 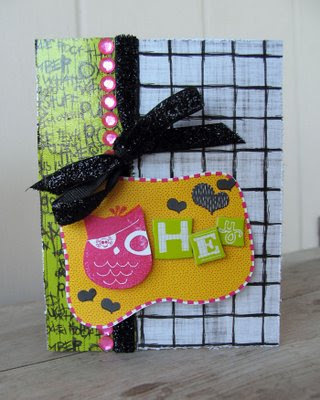 I made this little owl card using the new stamp kit and rub-ons and bling. And here she is!! Miss Holly-looking fabulous as always! I stole this photo from her and decided this is the perfect backdrop for it! Love her hat by the way! 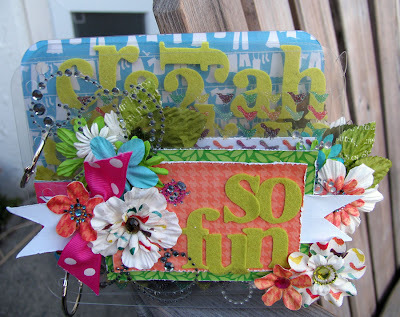 I used swirls, large page Pebble and small too, rub-ons, flowers and felt letters. Oh and black gems--they are fun to sprinkle around a page! Thats all for today! I'll be back soon for sure! I hope you had a great weekend!! The weather here was fabulous (for this time of year anyway). I got out and cleaned up part of my garden yesterday-it felt great to work outside with the sun shining on my face...ahh...can't wait for Summer! 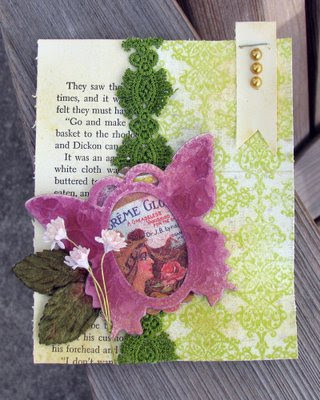 Today-I am featured on the Prima Blog using Tattered Angels Glimmer Mist and of course--Prima goodies. The two are a match made in heaven! I hope you've had the chance to try out some Glimmer Mist...this stuff is so amazing. You can layer colors, alter anything, use with masks, ...the list goes on. I am slowly collecting a variety of colors for my stash. I am addicted. Yes--indeed, I am. Here are my creations for the day. 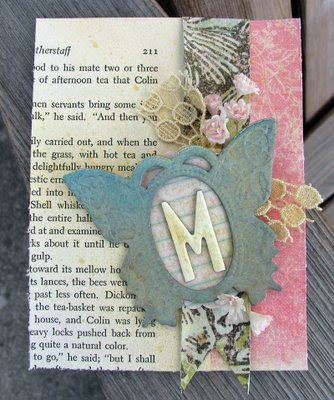 I created two cards using Prima paper, old book paper and Glimmer Chips-Butterflies. I love those B-flies! I layered color upon color. I experimented with many colors and let them dry for a bit. Then I used a few on these projects. 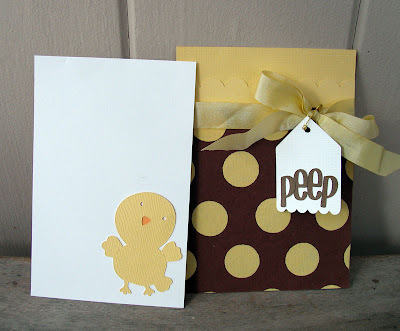 The first card-I used Gold, Cranberry Zing, Tattered Rose and Walnut Gold. And then-I sprayed onto Kraft Packaging that Prima makes for their paintables. Here I used Cranberry Zing, Scarlet, Golden Terracotta, Lime Twist and Lemon. Then went over the whole thing with Gold. I sprayed over flowers for a masking effect. I used a couple of Butterflies I had sprayed earlier-they are sprayed with Riptide, Walnut Gold and Gold. 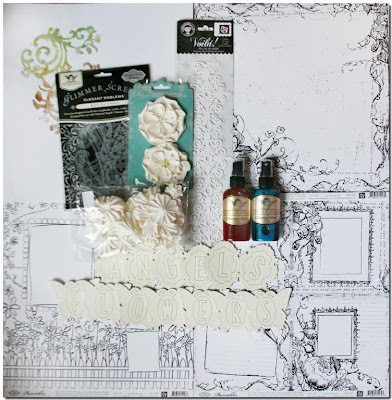 Check out the Prima Blog-this is the fabulous give away-they are taking sign-ups today!!! Thats it for today! I will be back with more projects and fun ideas! This week-I am enjoying Spring Break with the boys! I just love not having a schedule or a strict bed time. We had movie night tonight-made popcorn and watched Kung Fu Panda--I love that movie!! I can't believe I didn't see it sooner! They are trying out Kung Fu moves on one another now as I update my blog....it won't end well-I just know it. Right now, Hambly has featured Bad Girls on their blog!! YAY! Aaaannnddddd...I have a couple of class peeks for you to see. My Build A Book Class is coming up this weekend on the 18th. 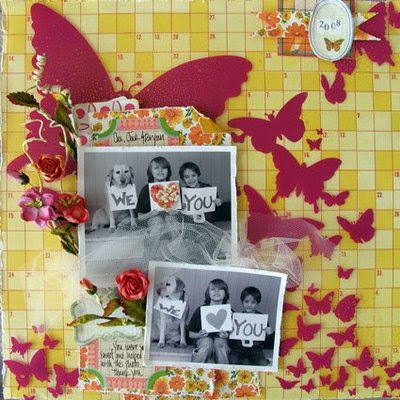 Let’s build our own book with clear pages, clever inserts and lots of great embellishments. Gorgeous Prima products! Any theme you like! 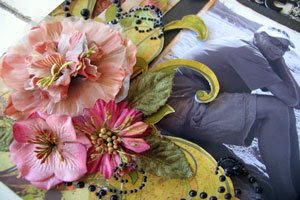 My canvas class is scheduled in Buffalo on May 28th at 6:00 at Buffalo Stamps and Stuff! 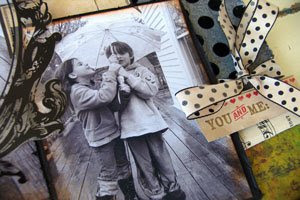 The album is 8x8 in size with clear and canvas pages that we will adorn with fabric pieces, paints and more! Create it with any theme in mind! I have been a busy busy girl and i still have a lot more to do!! Here are some Spring cards I made with my Cricut! Well, Spring Fling card event is over-it was such a great time! I love seeing the regulars and meeting new ones too! All of the prepping and hard work is totally worth it everytime! I hope to see all of them in the Fall--I look forward to it! It's scheduled for Oct. 3rd! Everyone is so sweet and so appreciative--how did we get so lucky with a group like that? And there were quite a few that couldn't make it that I missed!! SAD!! 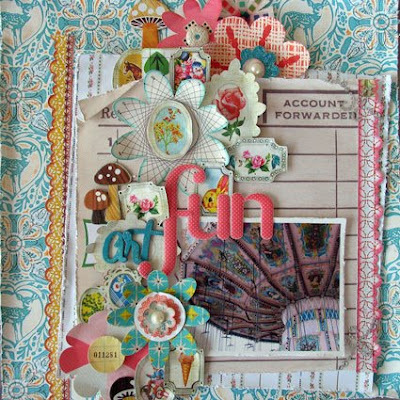 Get creative with this chipboard minibook and some of my favorite papers from October Afternoon. 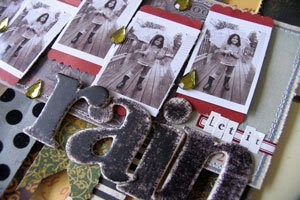 Darling embellishments, great stamp images and creativity = a great book! All of my classes are chock full of techniques, goodies to play with and we always have fun! I will have samples completed very soon and on display. 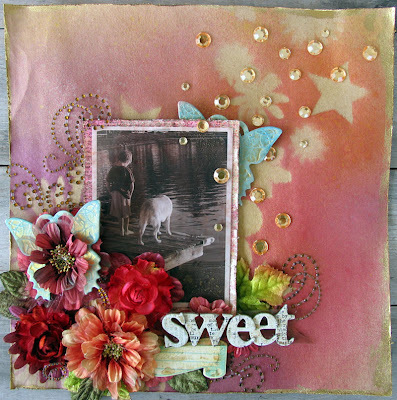 And Prima is teaming up with Tattered Angels this month-make sure you check out the Prima blog for fun ideas and inspiration! 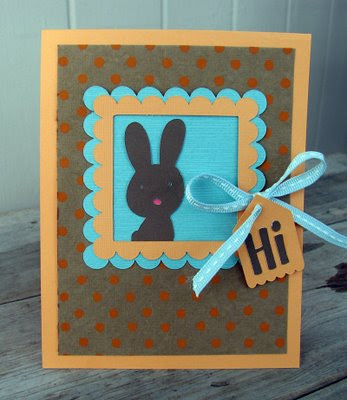 I just love glimmer mist and their stencils--so addicting! I love to spray away! 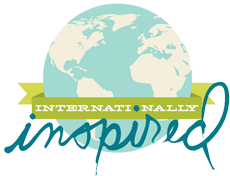 I'll be featured on April 20th but don't wait until then to see all of the great ideas-make sure you visit each week! Gotta run! Be back soon with more schtuff!! The April Kit at Bad Girls has been revealed-Butterfly Kisses! I loved this kit so much!! 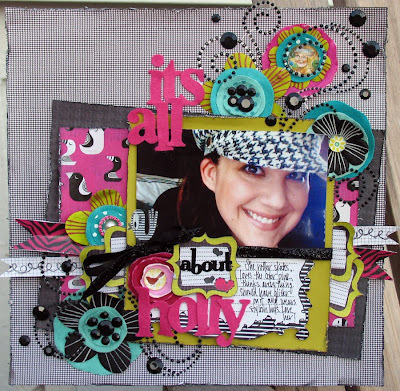 It is so bright and cheery with whimsical papers, diecuts and amazing possibilities! I think this is my favorite kit to date--I just love Sass A Frass Lass so much! 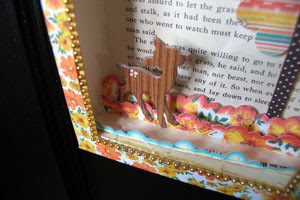 This first project, I used a C&T Publishing Shadow Box--they have great stuff! This shadow box originally had a lid so the whole thing would close as a box. 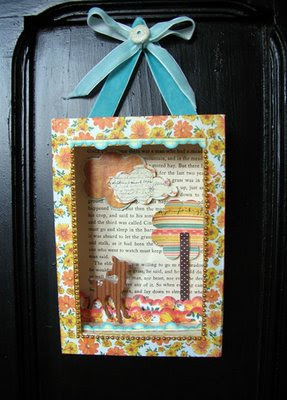 Instead, I cut off the lid and made a hanging shadow box with a sweet little scene inside. 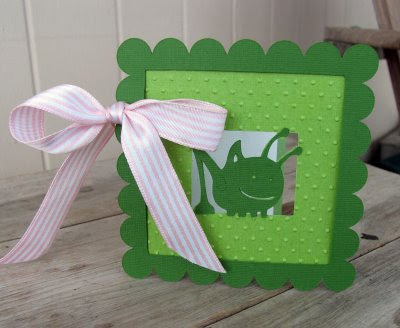 I decorated around the frame using distress ink and distress stickles. Then added gold pearls. On the inside, I used a page from an old book and then created my scenery. I attached ribbon to the top so that I could hang it on the wall. 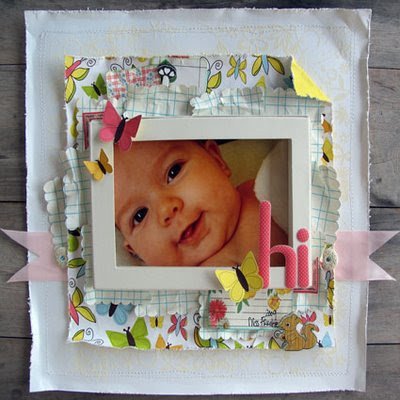 On this next layout-I used the lid from the box as a photo frame-love the way it pops out! Miss Frankie looks so sweet! 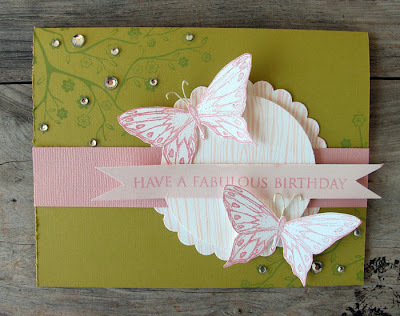 The background of this layout has been stamped and then embossed with white emboss powder. I stitched a border too. I punched a bunch or scallopped squares and tucked them behind the frame. This is our Ad challenge for the month-a challenge Wendy posts every month to win a cool prize! This is my interpretation---Eat Cake!!! It's Delicious! Thats a photo of my brother when he was little enjoying a piece in his fabulous outfit! I just loved the Hambly Butterfly Screen Print-I didn't want to cut it up! I added paper behind it and sprayed Gold Glimmer Mist over the whole thing. I love to stare at the old Amusement rides whenever I visit a fair. They have some amazing details and beauty that I can't help but notice!! So I decided to scrap a photo I took of the swing ride at the fair---it was gorgeous!!! And pink!! I went a little crazy with die cuts-but it was fun! Thanks for stopping by!! I will have more goodies to share soon!